There are currently 35 online users. Hi all, I’m having some issues playing Zelda link to the past using mGBA on the Nintendo switch. example Pegasus boots: the boots start to activate, but just stutter no matter how long I hold down the A button. If I try to walk, I move at something like 2/3 normal speed. It's almost like the A button is repeating like a keyboard key instead of just staying on the whole time. - Remapping controls: Being able to map controls by button- so I could use L/R as Start/Select as well as keeping the Start/Select buttons still enabled. Also, the ability to use a touch screen tap as an input would be useful as well as being able to map separate control schemes for GB/C and GBA. - Autofire: would love to see this implemented, as it's standard in most other emulators. - 3D slider support: as seen in other emulators such as VirtuaNES and Snes9x for 3DS, enabling the slider, even without the 3D effect, enhances image quality on the 3DS top screen. - File Browser improvements: An option to hide non .gb/.gbc/.gba files from appearing in the browser would be great, as well as scrolling text for titles that get cut off at the edge of the screen. Having the browser open on the last title you launched would also be a helpful feature. Thanks so much for your work on this, endrift! Are there any plans for an Android Port of the emu? Also are you planning on adding the multiplayer feature on the DS emu? I know that medusa is in alpha phase, or pre alpha xD, but I wanted to know if there is any dependence out of the common with mgba, because when trying to compile medusa I get this error. How can I change webcams for Game Boy Camera? Is there a way to change webcams for Game Boy Camera? If you know if you can and/or how, PLEASE COMMENT ASAP! How to fast-forward in MGBA on wii? I did not see any key mapping in the options. I am new to using this emulator and checked the FAQ, was not able to find anything. Hello. I am currently trying to emulate a game on mGBA, but there is no video. Just audio, nothing else. How can I fix this? Also, if anyone answers, thanks! While this is not a very important feature, it would be neat nonetheless, especially for when online multiplayer becomes available and people can join request for Pokémon trading or MegaMan Battle Network battles. Hello! I've been working on integrating my Wanderbar sidebar thingy into Windows mGBA 0.6.1, but I know almost nothing about Qt and threads, plus the mGBA source code is light-years more advanced and cleaner than anything I could ever produce. Still, I've been poking at the code and learning how things work. I've mostly got my Wanderbar working with mGBA now, but the biggest (and probably final) snag is that I need to call my Wanderbar's "doLogic" function before each GB/GBC/GBA CPU instruction. 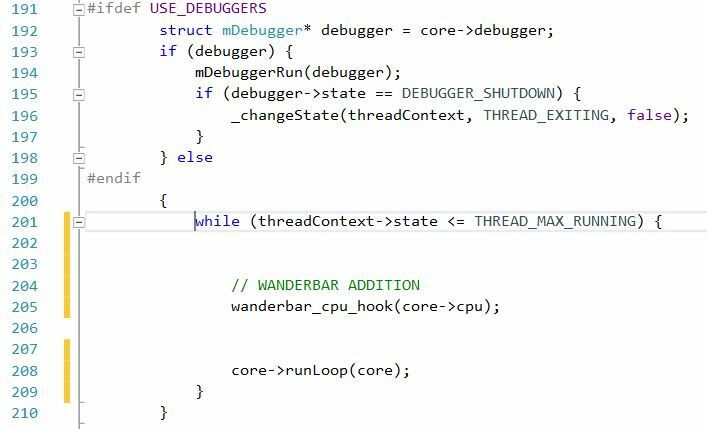 The issue is that I need to move this call out of thread.c and make it so that GameController.cpp (or maybe Window.cpp) calls my Wanderbar logic function instead. So basically I can't find a clear way to make it so that GameController.cpp knows when a core CPU instruction is about to be executed.